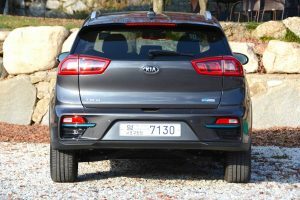 It wasn’t that many years ago when Kia was a relatively unknown brand in the UK. It then progressed to a brand best known for offering good value. Over recent years Kia has brought new models to market that are better than those of many established competitors – and we’ve even had the excellent Kia Stinger. Now the brand has launched a pure electric compact crossover-style offering with a 282 mile range for less than £33,000. 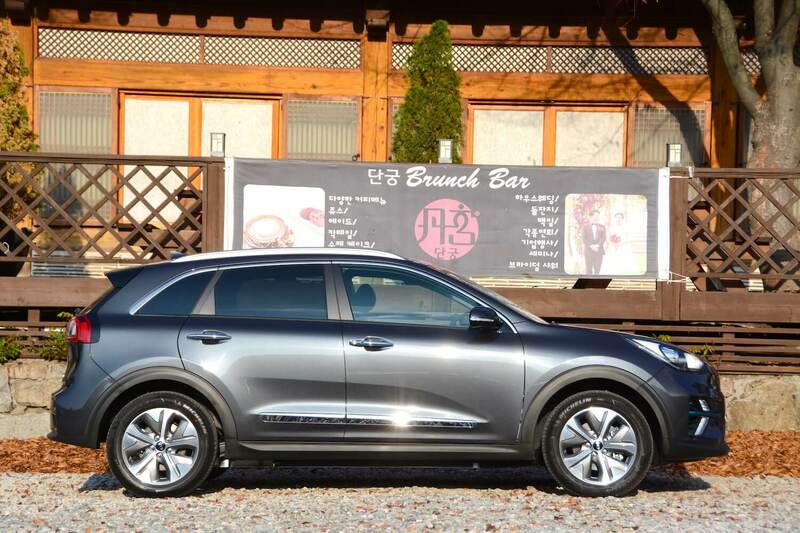 The Kia Niro body will be a familiar sight. 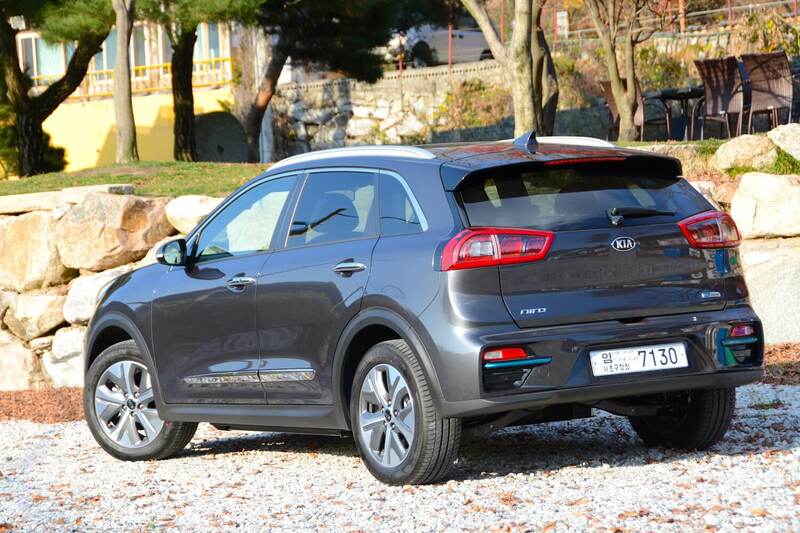 You can already buy the Niro Hybrid, and the Niro Plug-in Hybrid. 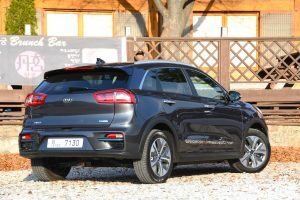 But now the fully electric e-Niro is available with the 64 kWh ‘long range’ lithium-ion polymer battery pack that has already appeared in the Hyundai Kona Electric. The Niro has a practical ‘compact crossover’ body style – it’s a larger car than the Kona, with good space for rear seat passengers, and a decent-sized boot. The boot capacity (451 litres) is actually larger than that of the Niro Hybrid (382 litres) and the Plug-in Hybrid (324 litres) because the battery is mounted under the floor in the pure electric model. 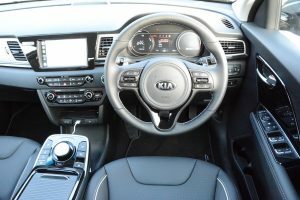 Internally, the dashboard is the normal sensible and clear Kia approach. 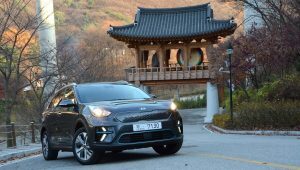 To provide the very earliest possible drive of the e-Niro, Kia flew us to Korea. The cars were the actual vehicles that are coming to the UK – but we could get to the cars in Korea quicker than the cars could get to us in the UK. The driving route was from Kia HQ in Seoul to the North Korean border, and then back to Seoul. 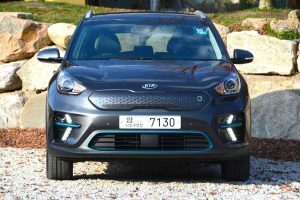 The first stage of the route was a long stretch of highway, with a speed of around 80-90km/h (when not stuck in Seoul traffic jams), which the e-Niro coped with effortlessly and quietly. By the time we’d reached the border with North Korea it was already evident that the battery charge gauge was going down very, very slowly. From the North Korean border back to Seoul there were some more interesting roads, twisting through hills. Up until this point the e-Niro had been extremely efficient, in Eco and Normal drive modes, but if you now selected Sport, then the car showed that it also had the strong, linear acceleration that is typical of most electric cars. Like the Kona Electric, the e-Niro is front-wheel drive, and if you’re enthusiastic with the throttle, then the generous levels of torque (395 Nm) can overpower the limits of grip of the front tyres, especially on wet roads. There’s no gear selector for the automatic transmission – just buttons for Drive, Reverse and Park. But you can adjust the level of brake regeneration using steering-wheel mounted paddles – which is a helpful substitute for the ability to change gear, especially on twisty, hilly roads. Although the e-Niro is a relatively high vehicle, because the (457kg) battery is located under the floor, there’s a low centre of gravity, which assists the handling. The e-Niro weighs 1,812 kg in total, but it still has a comfortable ride. Another benefit of the e-Niro is that the steering wheel has adjustment for height and reach, unlike the Nissan LEAF, so most people should be able to get a comfortable driving position. The Kia e-Niro has zero tailpipe emissions and a combined electric driving range of 282 miles based on the new, more realistic, WLTP test. This was initially reported as 301 miles, but a correction was made, and the figure was subsequently revised to 282 miles. The city element of the WLTP test produces an impressive range figure of 382 miles. The Hyundai Kona Electric combined WLTP range has now been revised to 279 miles – so the e-Niro has the edge by three miles. So what about the e-Niro’s real-world range? On the launch event in Korea we weren’t able to carry out any form of 100% scientific test, but we drove 108.5 miles, at an average of around 50mph, at the end of which we still had two-thirds of battery charge left. This approximates to a projected range of 325.5 miles – beating the (revised) official WLTP combined figure. We’ll have to wait until we can have an e-Niro for a week in the UK before confirming our real-life range findings. The e-Niro has a battery heating system which is designed to insulate and warm up the battery while the vehicle is plugged in, minimising the adverse effects of cold temperatures. And the e-Niro has a lower drag co-efficient (0.29 Cd) than the Niro Hybrid and Plug-in Hybrid models (0.30 Cd). Charging the e-Niro from 0-100% using a 7kW home charge point will take just under 10 hours (so this can be done overnight). A charge from 0% – 80% using a rapid (50kW) DC public charge point takes 1 hour 15 minutes. This could be done in 54 minutes using a 100kW charger. 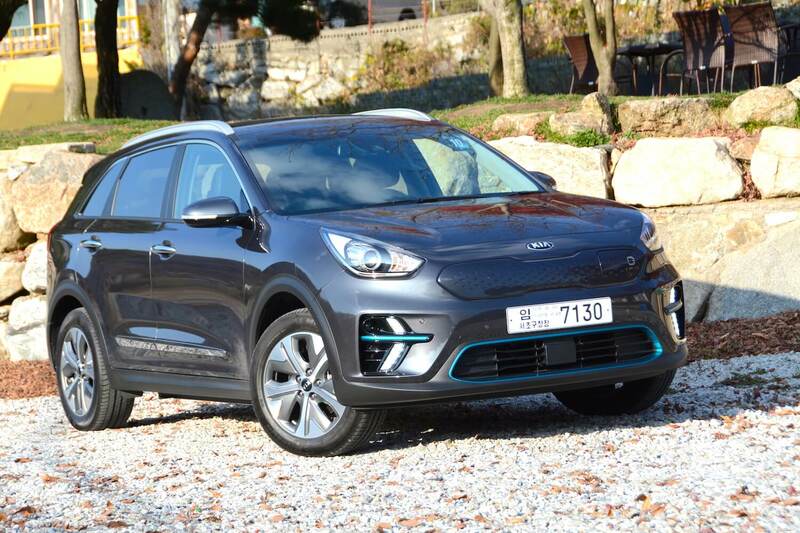 Our Kia e-Niro 64 kWh ‘First Edition’ test car – the only spec of e-Niro available – is priced at £32,995 after deduction of the (recently reduced) £3,500 UK government plug-in car grant. In comparison, the Hyundai Kona Electric Premium SE spec, available just with the 64kWh battery, costs £32,795, after the £3,500 grant. So the e-Niro costs just £200 more than the Kona. 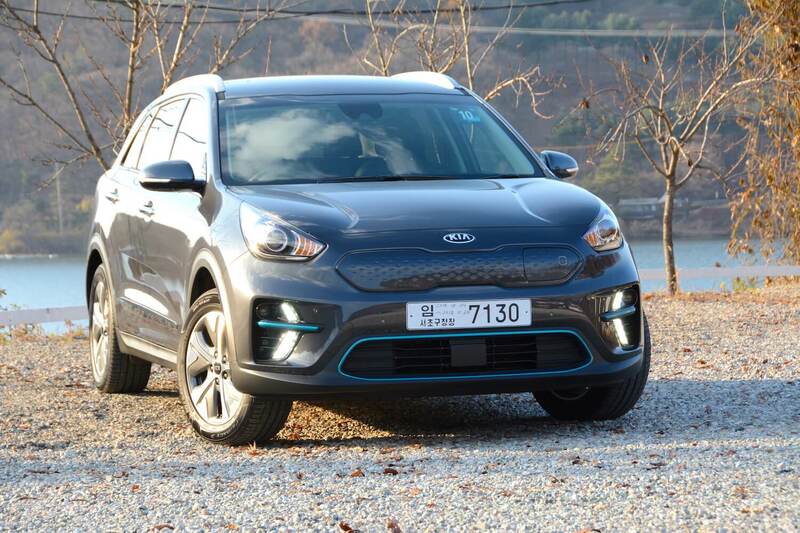 The Kona Electric, which shares the same powertrain as the e-Niro, has been rated very highly by us, so is there any benefit of the e-Niro over the Kona? The answer is yes, as it has more space. The e-Niro is 4,375mm long, versus 4,180mm for the Kona, so there’s 195mm of extra length. The e-Niro has 451 litres of boot space, compared to 334 litres for the Kona Electric, so that’s an extra 117 litres. 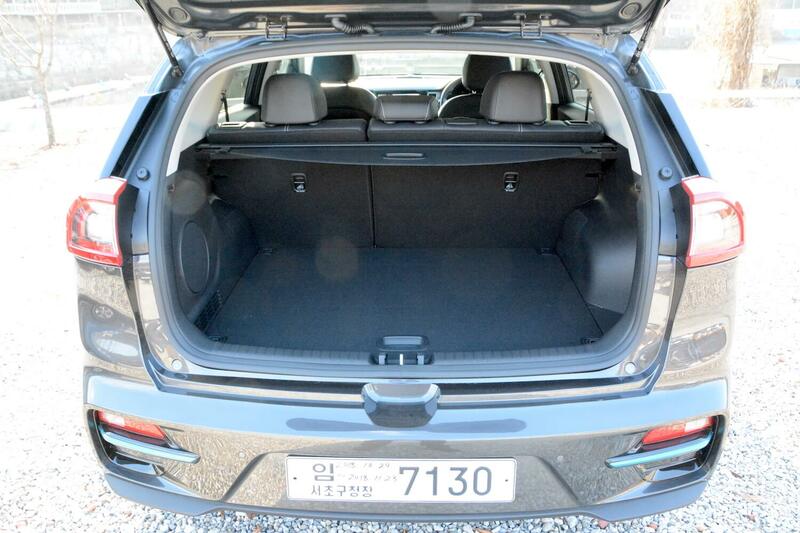 With the rear seats down, the e-Niro has 1,405 v 1,116 litres – an extra 289 litres. To put this into some sort of perspective, an airline cabin bag can be up to around 40 litres in capacity, so the e-Niro would theoretically allow you fit an extra seven cabin bags compared to the Kona. One other point to note is that the Kona Electric is available with two battery sizes: a 64 kWh battery or a 39kWh battery, whereas in the UK the e-Niro is available only with the ‘long-range’ 64 kWh battery (although the 39kWh battery is available in Europe). 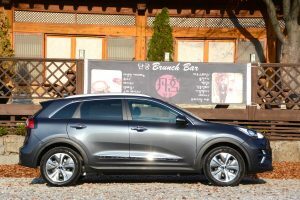 Kia says the reason for this is to “keep the message about the e-Niro simple”. 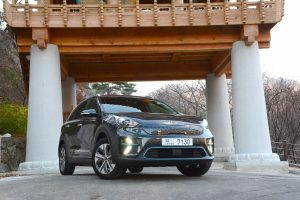 The e-Niro is on sale from all Kia dealers from 1 April 2019. It has a Benefit in Kind tax rate of 13% for the 2018/19 tax year, which increases to 16% in 2019/20. Along with other EVs, the BIK is then due to reduce to 2% in 2020/21. The e-Niro also has a 7 year / 100,000 mile warranty. The Kia Niro is also available as a Hybrid and a Plug-in Hybrid. The Kia e-Niro offers car buyers a pure electric vehicle that we’re sure can cover 300 miles on one charge in the real-world if it’s not driven constantly at motorway speeds. It also has a practical body style, and at just under £33,000 after the recently revised (ie. reduced) UK government plug-in car grant, it’s relatively affordable. 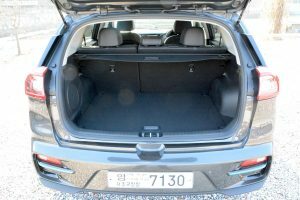 We’ve already rated the Hyundai Kona Electric very highly; whether you prefer the design of the Kona or the Niro is a subjective thing, but the e-Niro offers similar benefits to the Kona, but with more space. Therefore, for addressing many of the common objections to EVs (such as insufficient driving range, high price, impractical body styles etc), and for leap-frogging past the likes of the Nissan LEAF in terms of driving range, the Kia e-Niro gains a Green Car Guide rating of 10 out of 10. Car buyers typically say they would want an EV with a driving range of at least 300 miles before they would buy one, so now there’s no excuse. Is there any way to improve the e-Niro? We’d repeat the same suggestion that we made for the Kona Electric – an all-wheel drive option would deliver all that torque to wet roads more effectively than front-wheel drive. But in the meantime, with our government encouraging motorists to buy cars that help with the two major challenges of climate change and local air quality, then the Kia e-Niro is a solution with very few downsides.